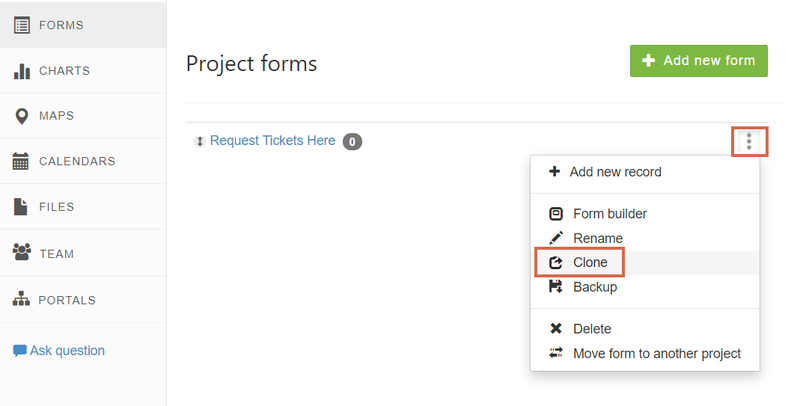 Every user can clone their forms with all fields using a Clone link in the Forms menu. When you click on 'clone' it will copy all the form settings, both form and database widget settings. Also all fields with their validation options, default values. Records will not be copied. You can use form duplication for saving your form before trying something new. If you have many similar forms, for example if you a have form with 20 fields for every school year - creating a new form for every year will be a big pain for you. That is why the Duplicate Form feature can be very useful for you. Another way is to reuse a year from the year your copied forms with a saved format, maybe with small changes. Duplicate your online form and save your time creating similar forms now!